Investment Banking 2 Edition The No. 1 guide to investment banking and valuation methods, including online tools In the constantly evolving world of finance, a solid technical foundation is an essential tool for success. Until the welcomed arrival of authors Josh Rosenbaum and Josh Pearl, no one had taken the time to properly codify the lifeblood of the corporate financier?s work?namely, valuation, through all of the essential lenses of an investment banker. 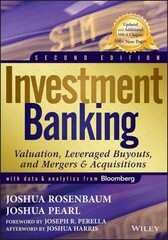 With the release of Investment Banking, Second Edition: Valuation, Leveraged Buyouts, and Mergers & Acquisitions, Rosenbaum and Pearl once again have written the definitive book that they wish had existed when they were trying to break into Wall Street. The Second Edition includes both the technical valuation fundamentals as well as practical judgment skills and perspective to help guide the science. This book focuses on the primary valuation methodologies currently used on Wall Street: comparable companies analysis, precedent transactions analysis, discounted cash flow analysis, and leveraged buyout analysis. With the new fully revised edition, they have added the most comprehensive, rigorous set of intuition-building and problem-solving ancillaries anywhere?all of which promised to become essential, knowledge enhancing tools for professionals, and professors and students. For those who purchase this edition of the book, there are options to purchase the Valuation Models separately (9781118586167), and to also consider purchase of the Investing Banking Workbook (9781118456118) and Investment Banking Focus Notes (9781118586082) for further self-study.